The IELTS strikes fear into the hearts of thousands of students worldwide. This English language exam can be enough to discourage anyone from studying abroad. The expense and the hassle are immense. However, if you qualify, you can write a letter to get the fee or even the test waived. The international English language testing system is the most popular way of testing English proficiency around the world. If you intend to study or work in an English-speaking country and are not yourself a native speaker, there’s a very good chance that you will need to take this exam. The test is scored on nine bands and test-takers are ranked from 1 (non-user) to 9 (expert). All standard varieties of English – include New Zealand, Australian, North American, and British English – are accepted. If you’re certain you’ll be a nine, here’s how to write a waiver letter for ILETS exam (the tips below will work for a TOEFL waiver too). If you are a non-native English language speakers and you want to study or work in an English speaking country, your company or university will ask you to take the International English Language Testing System (IELTS®). Depending on your score, they will decide if you are a strong candidate and pursue your application, or not. However, if you have already a good English language level, you can write a waiver letter, so you do not have to take the test or present the results. 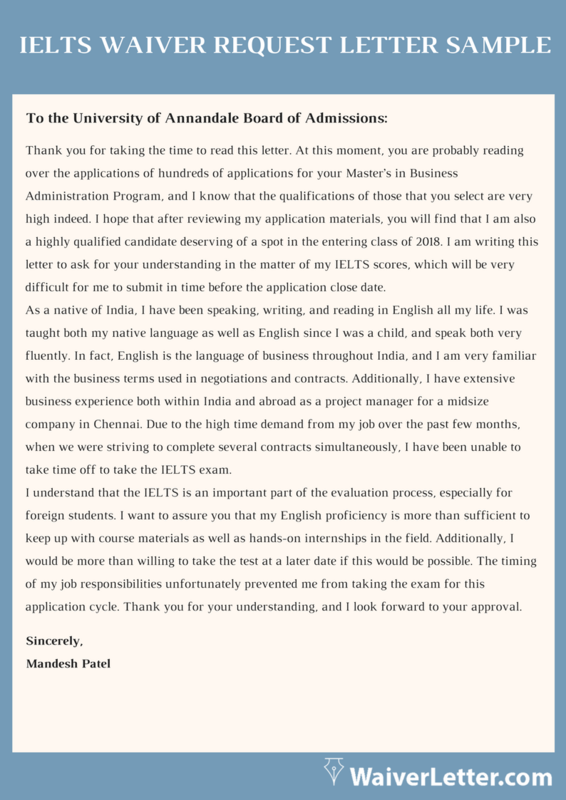 An IELTS waiver letter is a written communication where you ask the admission board to grant you an IELTS waiver. You may need it if you do not want to present your IELTS® results, or if you do not want to take the test. If you have studied in an English speaking country, or if you have already taken an English language test, you can ask for an IELTS waiver. If you have already taken the test and you got a good grade, you can include your certificate as evidence of your English language level. If you want to learn how to write one, use an English proficiency waiver letter sample as a guide. 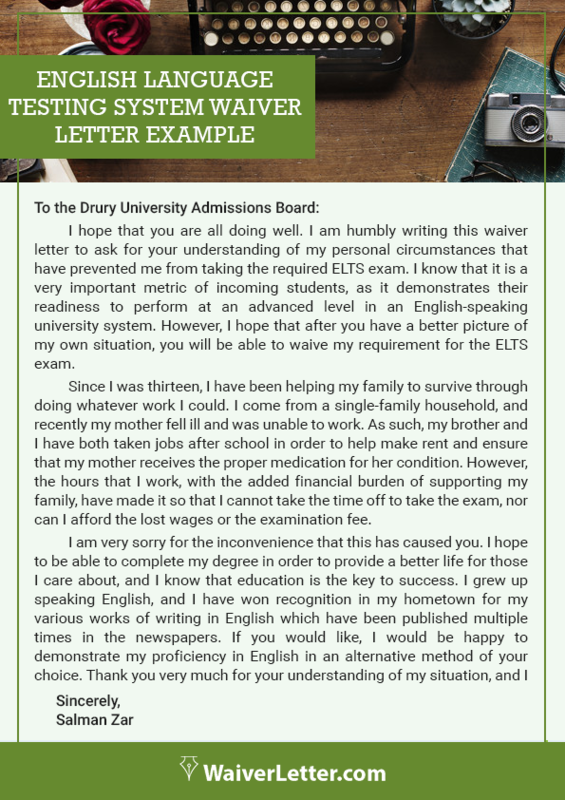 If you have decided to write an IELTS waiver letter, there are some requirements you will need to meet – check out our English language test waiver request sample to get an idea of what we are talking. Ensuring you meet them all, will help you to multiply your chances of getting your IELTS waived – bear in mind that these requirements may change from one institution to another, or from one company to another, so make sure you contact them first. For starters, if you have already taken the IELTS®, you can include a copy of your IELTS paper as support for your IELTS waiver – there is no need for you to take the test twice if you have already got the score you need to enroll in a particular course or apply to a job. Having studied for two years, at least, in an English speaking country is another requirement that some universities will ask you to have. Also, another requirement for some universities is to include evidence that you have studied in English, full-time, a degree at a recognized institution. Other requirements that you need to meet if you have decided not to present your IELTS® score is to include evidence that explains why you do not want to do it. You can attach medical files or health certificates that may help you with your request. Write the date, then skip two lines. Write the recipient’s name and address. Two lines below, add a greeting (Dear [name], for instance). Write an introduction, in which you include the reason you are writing and your basic request. Add a body paragraph or two with supporting evidence. Add another short paragraph thanking the reader for their time. Type your name four lines below the closing. Then print and sign your name under. Structure it beforehand: Write yourself an outline with all those parts we just gave you. Then you just have to fill it in. Be concise but complete: Include all the important information, but leave the irrelevant details out. Get it proofread: You obviously don’t want to make a mistake that leaves a bad impression on the reader. Present your best face by asking someone to look over it for you. Important things first: When writing your letter, add the most important information, like your request and your main reason for it, at the top of the body or in the intro. Don’t make them hunt for it. When writing your IELTS waiver letter, you should pay attention to a few things. Knowing what those points are before writing your waiver letter can help you to prevent any unfortunate mistake. Using an IELTS waiver letter sample as a guide can help you remember those points. When reading an English language test waiver sample, you will see the writer pays extra attention to the type of language they use. It should be formal, but catchy, so you have to make sure you find the right balance. Click here and learn how to write MBA GMAT waiver in the best way! An English language waiver request letter also includes evidence in the form of certificates, papers, dates, or names, that will support your request. See how the writer mentions them and use the same technique. Another thing you should pay attention to is your grammar and spelling. Remember to proofread your letter before sending it to make sure it is impeccable. Since you are writing a letter to ask for an IELTS waiver, your English should be perfect. If you think you may have some mistakes, give it to a professional writer so they can revise it and make adequate changes. 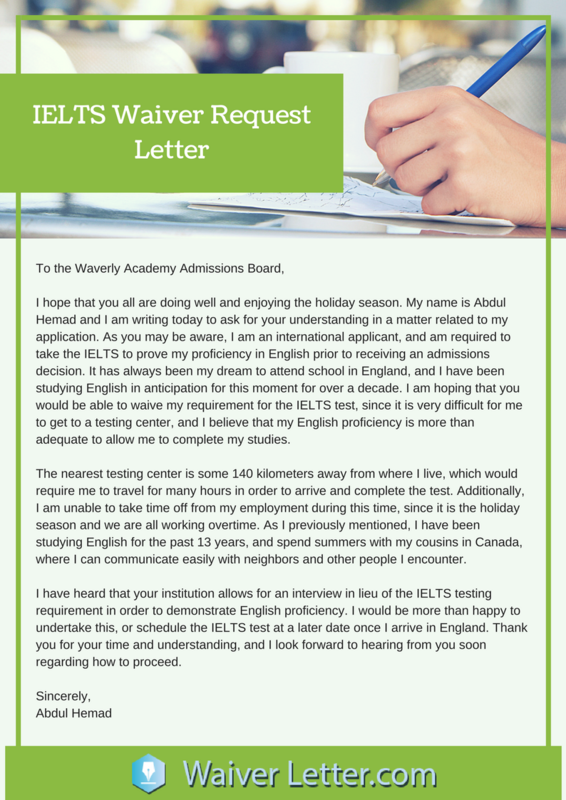 Writing a good IELTS waiver letter is definitely something that is difficult to do on your own. That’s why we’re committed to offering you help. We want you to succeed, and so we provide many services that can help you with your letter. Whether it’s writing one for you in close consultation with you, or giving you tips on the structure and proofreading your result, we’ve got you covered. Learning how to write a fee waiver request letter sample can be tedious, not to mention an IELTS waiver letter. But do not worry, our professional team of experts can help you. Our team is composed of expert writers and editors that have plenty of experience working with waiver letters. Our writers are specialized in various fields. Our experts can help you write a waiver letter for different situations. Our professional experts help us deliver high-quality services. We provide writing and editing services. Our skilled writers will tailor your letter according to your needs. Our proficient editors will revise your letter and make the necessary amends to ensure it is perfect. Our team will write your letter using formal but catchy language to ensure you have a chance at getting your waiver granted. The waiver letters are written for taking the consent regarding any specific purpose. It can give you the success that you probably never think of getting in such a short span of time. We provide unlimited revisions to make sure you are satisfied with your IELTS waiver letter request examples. Our team will do additional research if it is required to ensure your letter is perfect. We will always tailor your letter according to your needs. Our expert writers know how to write a goal-oriented waiver letter that can help you with your request. You will benefit from our money-back guarantee. If you do not like the waiver letter we wrote, we can give you your money back. As well as our on-time delivery guarantee. Our team will always meet your deadline. Our friendly support team works around the clock to ensure they are available if you need them. If you have any issues, you can contact them by phone, email, or chat, they are available 24/7. We provide secure payment methods. If you urgently need an IELTS waiver letter, contact us now and let us help you.